Our goal with Hotelhero is to help independent hotels and small chains to gain back control. We want to improve the understanding and adoption of technology in the industry and push innovation, helping hoteliers conquer their challenges of today and tomorrow. For quite some time we’ve been working on the right solution to do this. We had extensive discussions with hoteliers, restaurateurs, industry professionals, and tech providers to understand the different problematics and build a solution, which is mutual beneficial. Based on these first-hand insights we’ve decided to develop a free independent platform which centralises and simplifies the search for new digital tools and systems. In addition, we offer independent hotels and small chains personal assistance throughout their selection process for new digital tools and systems. The core of our platform is the selection of the digital tools and systems we partner with. Every day, we work hard on scanning and analysing the market, discussing different products and trends, and carefully selecting the systems and tools, which best suite European independent hotels and small chains. We are an independent platform and base our provider selection on the quality of their product, their level of innovation, open API’s (ability to seamlessly integrate with 3rd systems), customer support & training. We pride ourselves to only on-board top of the class providers. Meanwhile making sure to always offer a variety of solutions per category allowing hoteliers to make their own decisions and easily compare the solutions. 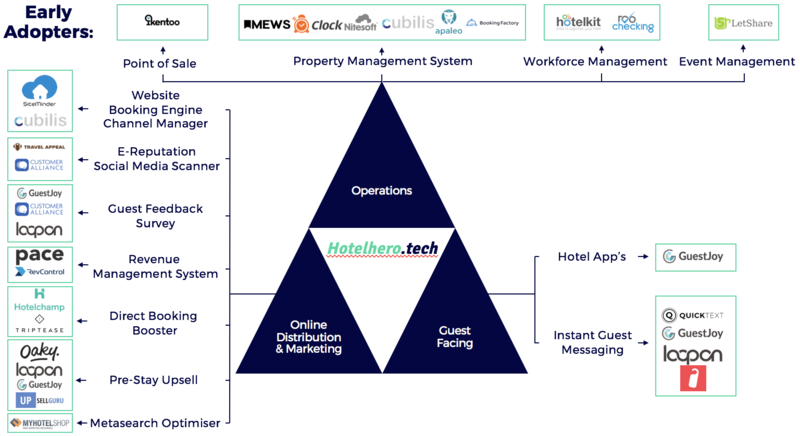 We are proud to have some of the most innovative solutions for the independent hotel market as early adopters. Our free and easy-to-use web-platform is designed to help hotels to discover, compare and select the right digital tools and systems. 1. The match-making tool helps hoteliers to personalise their search results based on their unique hotel characteristics. Allowing them to have a direct overview of the systems fitting their property and saving significant time during the initial research phase. 4. Hoteliers can request demo’s and pricing directly on our platform. Our team will take care of centralising all proposals and schedule initial calls. Check out our Portfolio and find the hottest new systems on the market!